Over the last few decades, the study of material culture has blossomed as a means to explore not only the evolution of specific technologies and their usage but also the histories of women, minorities, tradespeople, and others. Nineteenth century publishers’ bindings can be key to these studies: they are vital to researching the history of the book, the rise of literacy, the impact of technological change, the development of the decorative arts, and more. By the last quarter of the nineteenth century, publishers’ bindings had become (as they remain) marketing tools. These mass-produced objects targeted and attracted consumers while simultaneously broadcasting a distinctive style for the publishing house and its titles. From shop windows, bookstore shelves, and printed advertisements, books’ covers enticed observers to pick them up, to explore their contents, to own them. More than a century later, the allure of these objects still holds. In addition to the publishers’ bindings found throughout our stacks, Rare Books has a discrete collection of around 1,300 volumes built on the foundational gift of UR alumnus, librarian, bibliophile and scholar Robert F. Metzdorf. During the last year, we have added to our holdings of bindings designed by painter, teacher and stained glass artist Sarah Wyman Whitman (1842-1904). Whitman was a talented, successful artist and prominent figure in Boston’s intellectual, social and cultural circles when, in the early 1880s, she became the primary cover designer for Houghton Mifflin and Company. She is widely recognized as the first female professional artist to hold such a position. Over a 25 year period, Whitman created 250-300 covers, profoundly influencing book design and blazing a path for other women in the field. We share a few of these recently acquired Whitman designs here, with a focus on lesser-known covers. Some of our other Whitman bindings—along with other exemplars—may be seen in our exhibition Beauty for Commerce: Publishers' Bookbindings 1830-1910. Coolidge, Susan. Verses. Boston: Roberts Brothers, 1880. Coolidge, Susan. Clover. Boston: Roberts Brothers, 1889. Whitman’s first cover was designed in 1880 for Verses by her friend Sarah Chauncey Woolsey who wrote under the penname Susan Coolidge. This design is a clear adaptation of a series of covers (especially Atalanta in Calydon) by pre-Raphaelite painter and designer Dante Gabriel Rossetti in which he used Japanese-style rondels. On Verses, Whitman borrows from Rossetti, but overlaps and moves off-center her rondels, emphasizing her design’s asymmetry and use of negative space. Sent out into a marketplace full of wild, over-crowded book covers, this restrained design, set on daring white cloth, stood out and demanded attention. 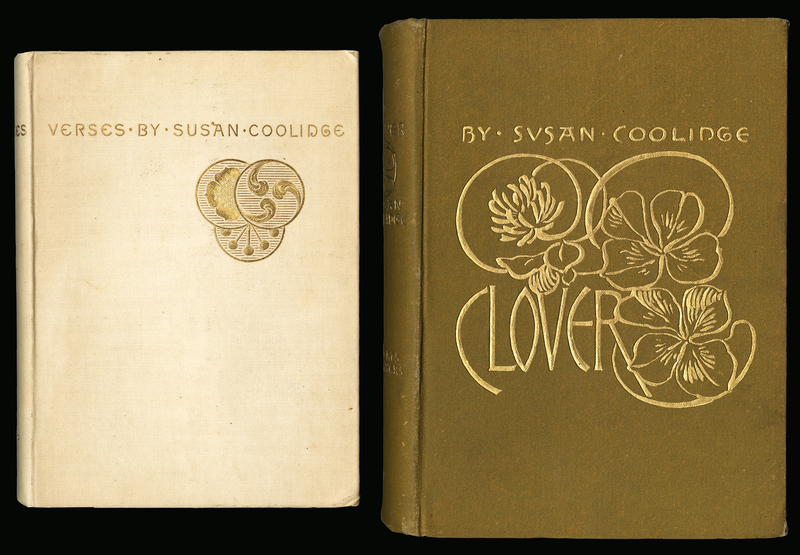 Whitman’s later and quite different design for Coolidge’s Clover makes subtle visual reference to the cover of Verses. In both cases, as with many of her earliest designs, Whitman introduced elements of the British Aesthetic and Arts and Crafts movements to an American audience. One of the distinguishing features of Whitman’s work is her lettering, done in two main styles. Her ‘rustic’ alphabet is characterized by the letter “a” surmounted by a bar, a “d” left open at the base, a rounded “e,” and an inwardly spiraling “g”—all drawn rapidly with a quill pen. The letters of her more formal style are drawn against a straight edge and the words are separated by dots. Even when transferred to metal dies and stamped by machine onto countless covers, this lettering, with its deliberate inconsistencies, helped Whitman bring a hand-made aesthetic to mass-produced commercial bindings. Crawford, F. Marion. A Roman Singer. Boston: Houghton, Mifflin and Company, 1884. Wiggin, Kate Douglas. Nine Love Songs and A Carol. Boston; New York: Houghton, Mifflin & Co., 1896. Gilder, Richard Watson. A Great Remembrance. New York: The Century Co., 1893. Many of Whitman’s covers feature stylized plant forms. 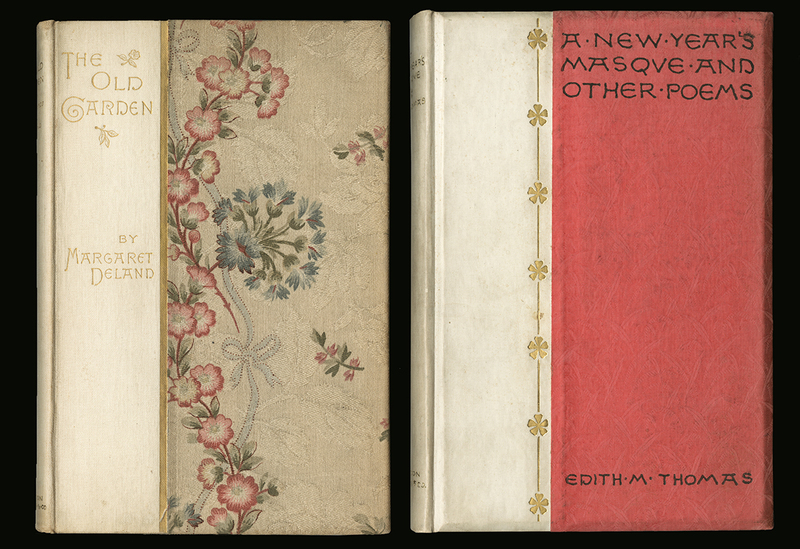 Each of the three covers seen above depicts an anemone flower, a bloom she also used for one of her most famous designs, Hawthorne’s The Marble Faun. Business correspondence with George Mifflin reveals Whitman’s involvement in decisions about binding materials and her interest in incorporating atypical textures and colors. 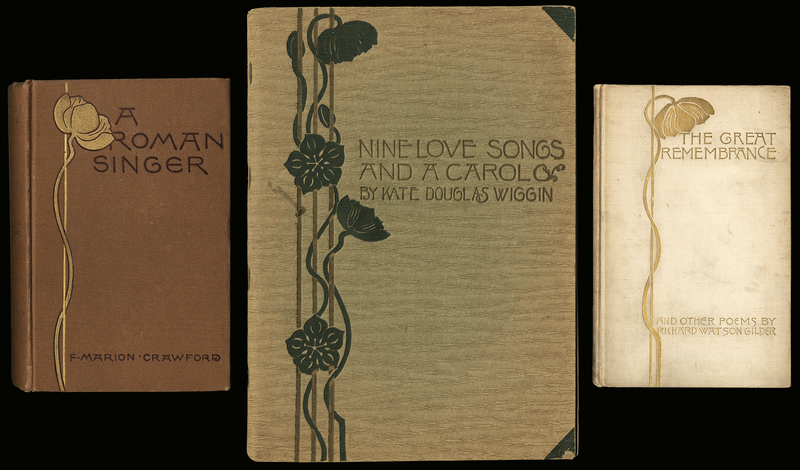 The cover of Nine Love Songs and A Carol, seen above, is made of a heavy crepe paper Whitman specifically requested. When preparing some designs, like the two seen below, Whitman sent scraps of dress cloth to the publisher and asked that similar materials be used. It is a testament to her influence at the firm that they agreed. Deland, Margaret. The Old Garden: and other verses. Boston; New York: Houghton, Mifflin and Company, 1889. Thomas, Edith M. A New Year's Masque, and Other Poems. Boston; New York: Houghton, Mifflin and Company, 1885. Holmes, Oliver Wendell. The One Hoss Shay. Boston; New York: Houghton, Mifflin and Company, 1892. Longfellow, Henry Wadsworth. The Courtship of Miles Standish. Boston; New York: Houghton, Mifflin and Company, 1896. Proctor, Edna Dean. 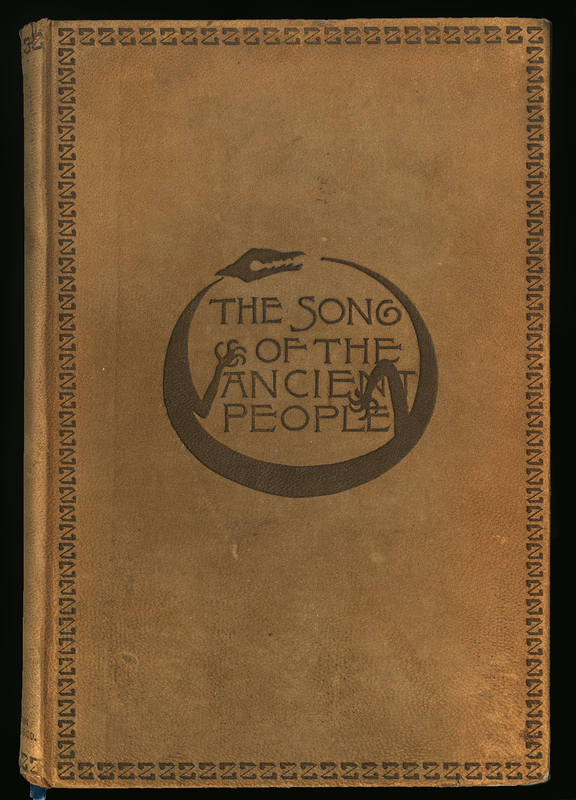 The Song of the Ancient People. Boston; New York: Houghton, Mifflin and Company, 1893. Allen, Sue. 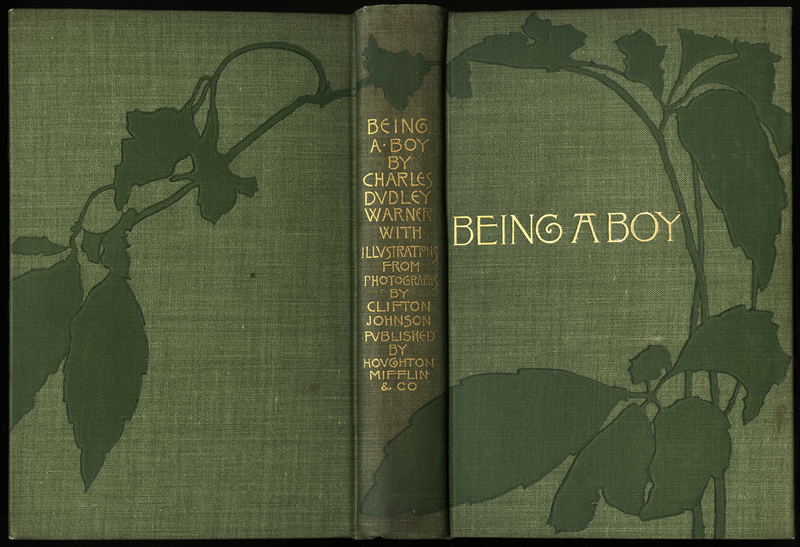 The Book Cover Art of Sarah Wyman Whitman. Boston: The Society of Printers, 2012. Allen, Sue and Gullans, Charles. Decorated Cloth in America: Publisher’s Bindings 1840-1910. UCLA: William Andrews Clark Memorial Library, 1994. Boston Public Library has a flickrset of over 300 Whitman bindings. Whitman, Sarah W. The Making of Pictures, Twelve Talks with Young People. Chicago & Boston: The Interstate Publishing Company, 1886. Whitman, Sarah. Notes on an Informal Talk on Book Illustrations. Boston: Boston Art Studentsʼ Association, 1894. Whitman, Sarah. Notes on an Informal Talk on Book Illustrations, (Boston: Boston Art Studentsʼ Association, 1894), 8. Ibid, 5. "…You have got to think how to apply elements of design to these cheaply sold books; to put the touch of art on this thing that is going to be produced at a level price, which allows for no handwork, the decoration to be cut with a die, the books to out by the thousand and to be sold at a low price…"
 Commercial Bookbindings: An Historical Sketch, with some Mention of an Exhibition of Drawings, Covers, and Books, at the Grolier Club, April 5 to April 28, 1894, (New York: Grolier Club, 1894), 14.